Anne Hogarth wrote this book for the younger Muffin reader plus The Red, Blue, Purple and Green Muffin books. There were several illustrators of the Muffin books, including Neville Main and Molly Blake - who was the daughter of Annette Mills. No detailed image to view. 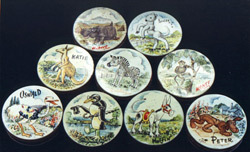 Huntley and Palmer Biscuit tins from 1949 depicting Muffin and some of his friends. Merry Muffin books by both Ann Hogarth and Annette Mills and illustrated by Neville Main. A series of six books dated 1954/55. Set of six postcards. Published by J.Salmon Ltd. 1950's Titles: Muffin at the Seaside Muffin's Picnic Muffin's Caravan Journey Muffin gets a Wetting Muffin Playing Cricket Muffin Fishing. A Muffin the Mule Christmas card. 1950's. Manufacturer unknown. Licensed by The Muffin Syndicate 1949. One of a series of birthday cards featuring Muffin and his friends. 1950's. Printed and published by unknown manufacturer but licensed by The Muffin Syndicate 1949. Mentioned in the programme for Cecil Landau's Christmas party in 1949. The slippers appear advertised in 1950 & 1952. Make your own Muffin appeared on the back of Kellogg's Rice Krispies in 1954. Mistaken Identity: Moody not Muffin. It seems that the most common case of mistaken identity in the toy world is that of Moody the Mule. As you can see from the box, Moody is definitely Moody and not Muffin but, trying to convince people is a difficult task! I hope that by providing the proof, memories will be revised. Many people are confused by the Pelham 'horse' or 'foal' which are thought to be Muffin the Mule. Muffin has sturdier legs (sharing the legs and body with Little White Bull) And a bell under his chin. The Moko Muffin Junior puppet was created by Mr Alfred Gilson in 1950. Indeed, he was invited to accompany Annette Mills to Selfridges to promote the puppet in the summer of 1950. Approximately 50,000 puppets were eventually sold. The puppet was marketed by the firm of Moses (Morris) Kohnstam. The Kohnstam Company was a leading importer of German toys into the UK and Moko was the company trade name. The marketing, in the early 1950's, was undertaken by Richard Kohnstam, (the founder's nephew), on behalf of Alfred Gilson. Mr Gilson had created a "Pressure Die-casting" business although, according to his son, Mike, his original skill was as an electrician. It appears that early creations of die cast toys for his children led to the setting up of a full time business. Mr Gilson ran the family business from a factory at 1a, Shacklewell Lane, Dalston, E8, London until he emigrated with his family to Canada in March 1951. The advent of the Korean War, in late 1950, meant that, by 1951, metals such as zinc (used to produce the Muffin puppet) could no longer be made available for the production of toys. Mr Gilson had emigrated to Canada in the hope that he could establish production elsewhere but, was not successful. The family later moved to Los Angeles where he lived until his death in 1980. During his time in Shacklewell Lane, Alfred Gilson rented part of those premises to a three some known as the 'Lesney boys'....and Muffin production was resumed after the war ended in 1953, under the auspices of the Lesney factory. Kohnstam and Lesney remained linked until 1959 when Lesney bought the Moko name. Very little information has survived about the Gilson contribution and I'm very grateful to Mike Gilson who provided the back ground information on his father and to Patrick Talbot for his considerable assistance in linking the information provided by Mike Gilson with his own research on die cast toys. Some of this information and further reference material may be found in "Collecting Matchbox Toys, the first 40 years" for which Patrick was Consultant editor.